The weather here has been fabulous the last few days. That, plus the start of daylight savings time, provided the perfect excuse for me to get out of the house and Easter-fy my front porch. Here’s the view approaching the front door. 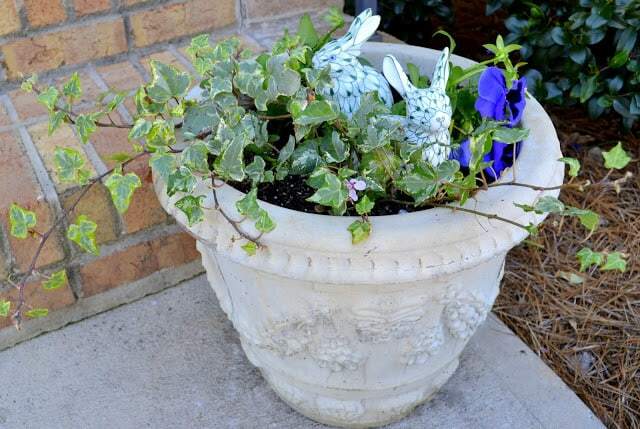 Do I spy Peter and Petunia Rabbit hiding among the ivy and pansies? This little guy is standing to the left of the door. I think the flower that he’s holding is meant to hold birdseed. 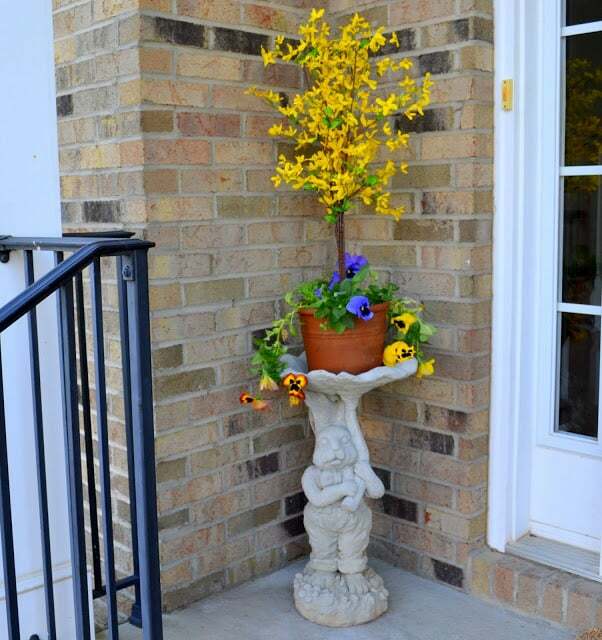 I added a pot of pansies with a forsythia “topiary” instead. One more little friend to help you up the steps! I picked up this egg wreath from Pier I after Easter last year. I added the hydrangea Peter Rabbit head and bow to ramp it up a little. I added new cushions and some colorful pillows to the sitting area. My granddaughters, Miss M and Miss K had fun filling the lantern with plastic eggs. A look through the railing. I think I just like the way the camera focused on the railing in the foreground. Thank you for stopping by. Ferocious Guard Dog and Diva Dog say “Come back soon”! Too cute! Like the wreath, rabbit bird bath, ribbon on the rabbit, the sparkly flowers in your plant, the pillows and most of all the eggs in the lantern! Not to mention the divas. But truly, everything is perfect for spring/Easter! Your porch is so pretty and full of eastery joy.. love the bunnies and eggs. 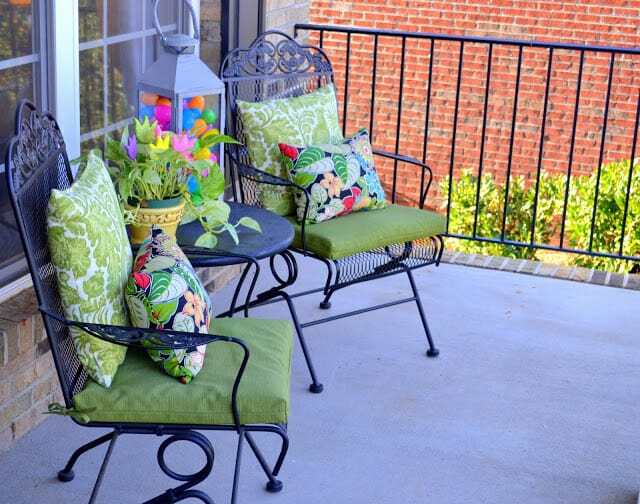 Very beautiful Suzy!…Love your very welcoming porch..Just want to sit in the chair with a cup of tea and good conversation..
How inviting – wish I could come over for a visit! 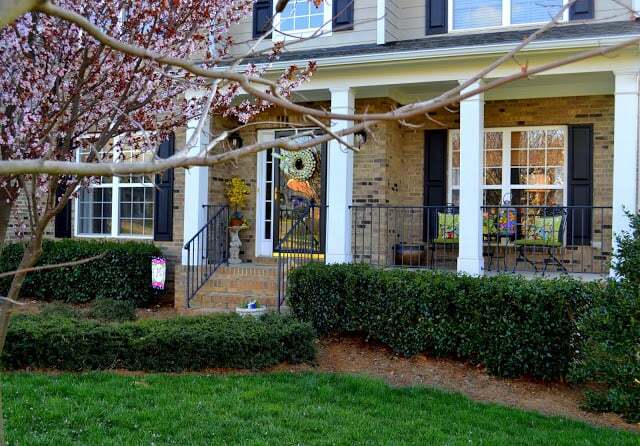 Love the wreath but the Easter eggs in the lantern did it for me. Looks so great! So cute! I really love the wreath. 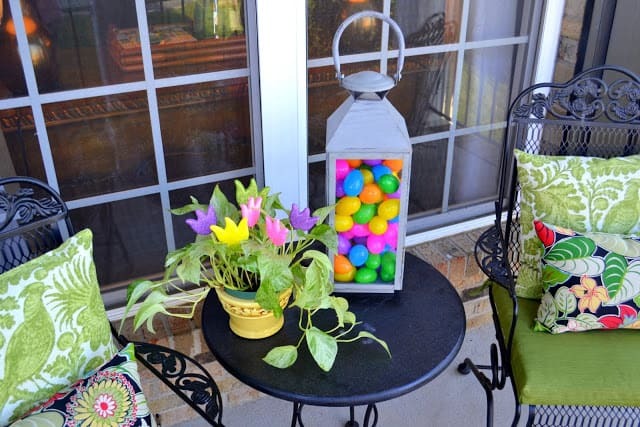 It all looks so bright and fresh and I love the little eggs in the lantern…great idea! It looks so good. I love bunnies and those 2 little ferocious beasts are adorable too. I wondered where all your bunnies were hiding….this looks great! I gave most of my bunnies away : ( because they no longer go with my interior spaces …what was I thinking!!!! So sweet! And the quality of your pictures is amazing!! I love the colors and the plant in the bunny. The chair cushions and pillows are very pretty and I love the wreath. 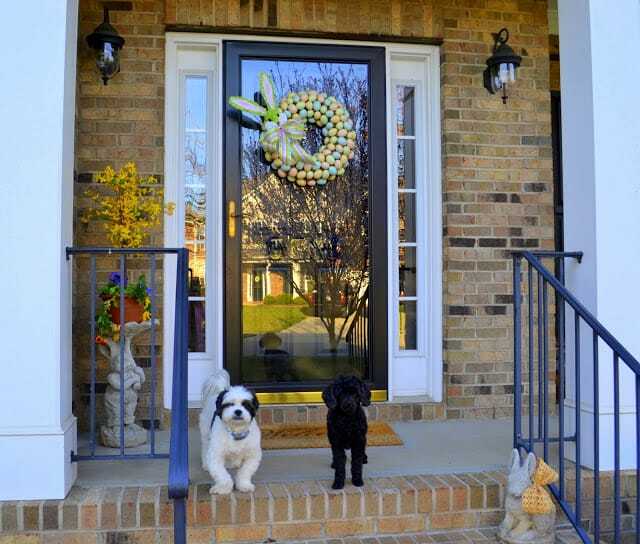 I just love the entrance to your home & your front porch! It is so darling all Easter-fied. That’s a beautiful wreath, & the bunny head is so darn cute. Wow! That looks so pretty and colorful! I love the eggs in the lantern! What a great idea! Perfect decor for spring! Lovely job. Very cute front porch!! 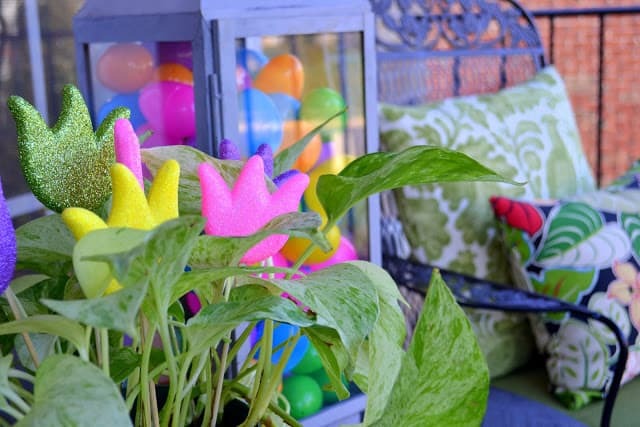 I need to Springify my front porch, too! I’d love for you to share this at my linky party going on now! 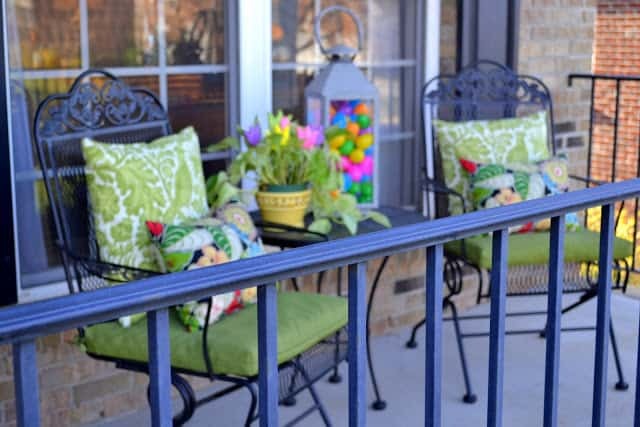 Love your Easter porch! It is so nice and colorful. Would love for ya to come over and join my porch partying! I love your Easter porch. You have inspired me to get out my Easter decor. Thanks for sharing at DIYbyDesign. So cute! Love your concrete bunny! It all looks so fresh and colorful! How fun! Makes me want to sit right there and enjoy myself. Thank you for sharing it! WOW! Your porch is a delight! 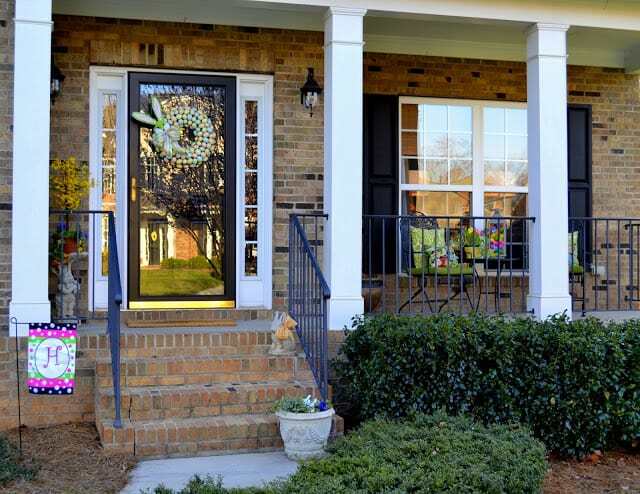 I need to follow your example and add some springy touches to my front porch–it’s one of my favorite rooms in our house, so I need to springify it! Thanks so much for linking to my party. I really appreciate it! I love it, the bright colors are fantastic and so festive. So pretty and welcoming! I adore rabbits and love to use them for decorating. 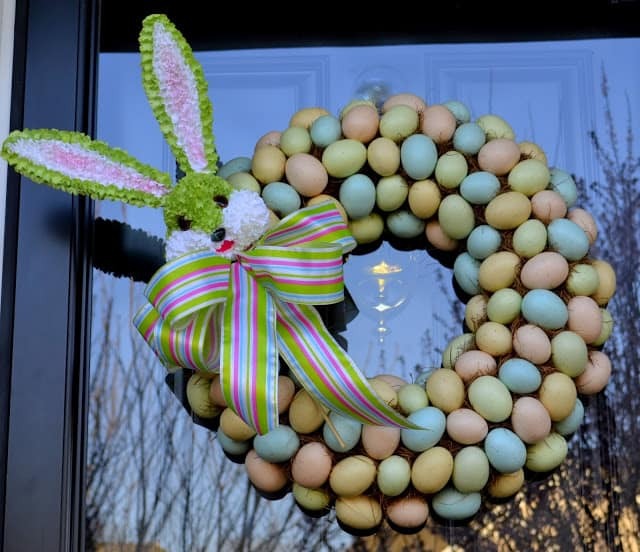 The Easter wreath is adorable with all of the bright colors. I love the bunnies peeking out of the flowers! 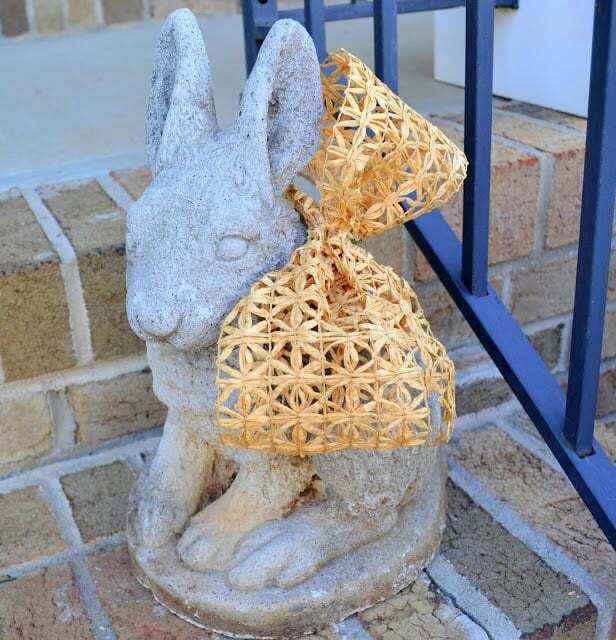 Love your front porch decor!! Beautiful and so very welcoming. And your 2 little pups look ao welcoming also to any company that you have have coming over!! Beautiful! So colorful too. I love your doggies:)! Looks adorable Suzy! Your home is beautiful! So enjoyed our lunch! Can’t wait to go thrifting together soon! Your porch looks so warm and inviting! We’d love for you to share it at our Beautify It Monday Link party going on now at BringingBeauty.blogpsot.com!